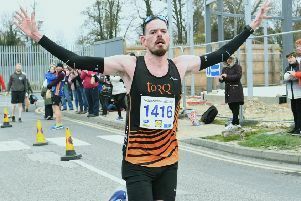 Peterborough AC coach and veteran competitor Karl Eve certainly had plenty to celebrate when the club kicked off their Southern League campaign with a Division Three North fixture in Watford. Although an Over 50 competitor, he still managed to gain B string wins in the pole vault (2.60m) and shot (9.27m). And in a coaching capacity there were also notable doubles to savour as two of his athletes gained two wins apiece - Lewis Davey in the A 400m (50.2) and B high jump (1.70m) and Megan Porter in the A 100m (13.1) and the A high jump (1.63m). Ellie Forrest was another double winner for PAC. The Under 17 all-rounder did well to take first place in the 100m hurdles A race in 16.9 and the A string shot with 9.52m. Men: 400m B - Daniel Mees 51.3; 400m hurdles A - Matthew Dalton 63.8; High Jump A - Jamie Horne 1.95. Ladies: High Jump B - Georgia Price 1.60; Shot B - Nana Owusu-Ansah 8.06.
Credit has to go to Georgie Ives-Lappin, who at just 14 stepped up to the plate to run a solid 75.8 in the 400m hurdles for second spot in the A race. Others worthy of mention were Georgia Price, Wendy Perkins and Sarah Caskey. Price volunteered to run a rare 400m leg in the relay after jumping new PBs in the long and high jumps, while Perkins ran the 400m, 800m and the 3,000m, and Caskey the 1500m, the 3,000m and the steeplechase – both well beyond the call of duty!